The religion of the Ancient Egyptians was extremely important to them and touched every aspect of their life. The religion of Ancient Egypt was a polytheistic religion (with many gods). There was just one short period of monotheism (the worship of one god), during the reign of Akhenaten - who became known as the Heretic Pharaoh. The God he worshipped was called Aten. The reign of the Pharaoh Amenophis IV ( Akhenaten ) saw massive religious and spiritual changes in Ancient Egypt. His ideas were not well received. The Religious beliefs of the Ancient Egyptians had evolved over thousands of years. They had many different gods and goddesses, each of whom represented various aspects of their lives. They knew the stories of each of the gods and their relationships to each other. Their ancestors had revered these gods, their whole lives revolved around these gods. They worshipped at huge temples built in honor of the gods and goddesses and shrines to various gods and goddesses were in every Egyptian home. Pharaoh Amenophis IV (Akhenaten) began his rules in 1349BC. He belonged to the Eighteenth Dynasty of the New Kingdom. The capital was located at Thebes near the great temple of Amun ( aka the Sun God Ra) at Karnak, which Pharaoh Amenophis IV attended at the beginning of his reign. Pharaoh Amenophis IV was about 25years old when he became Pharaoh and was married to the beautiful Nefertiti. At the beginning of the reign they follow tradition and worship the Gods and Goddesses of Egypt especially Amun-Ra. This was a very prosperous time and Egypt and the Pharaoh possessed great wealth. But so did the Priests. The priests had been made wealthy through the offerings given to them but they also possessed great power - perhaps even rivalling that of the Pharaoh. The God Aten was an ancient sun disk deity dating back 1000 years. The worship of the sun God Amun-Ra and reference to the ancient god Aten led to the belief that Aten was visible everywhere and the fundamental life-giving force in the universe not just a main god but the only god. Within just four years of his reign the god of the solar disk, Aten, was now worshipped by the Pharaoh and Nefertiti as the only deity, starting a religious revolution. The priests and many of the people were totally against giving up their old gods in favor of Aten. It was inevitable that the Pharaoh, his wife and the new religion would need a new base from which to flourish, away from Thebes and the great temple of Amun. The Pharaoh and Nefertiti chose the location of the new capital at el Amarna (aka Akehetaten) which was 250 miles down the Nile and located mid-way between Thebes and Memphis. The worship of Amun-Ra at Thebes was totally abandoned and replaced with the cult of a single deity, the God of the solar disk, Aten. A completely new city was built together with temples to the God Aten which were the focal points. The Pharaoh changed his name to Akhenaten meaning 'pleasing to Aten'. The Pharaoh Akhenaten closely aligned his position with the God Aten and the representations and depictions of the Pharaoh became asexual portraying him as both the father and the mother of Egypt. The concept of Divine Kingship was further emphasised and Arkhenaten was the sole representative of Aten on earth. The priests were given less power but Queen Nefertiti was given more power, almost as a joint ruler. The country was in uproar. The familiar Gods had been replaced by the strange single deity, the God Aten. The priests lost most of their power to the autocratic kingship of the Pharaoh Akhenaten and the wealth of Egypt was directed towards creating and building the cult of the single deity, the God Aten. All the time of the Pharaoh Akhenaten was focussed on the new religion of the God Aten leaving Egypt open to attack from the Babylonians, Mitanni and the Hittites and the empire of Egypt began to disintegrate and some of the lands were taken over by the Hittites. 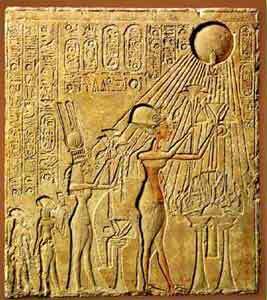 With the move to Amarna the god of the solar disk, Aten, was established and worshipped as the single deity. The Pharaoh Akhenaten assumed an earthly god-like persona with all his words and actions being viewed as sacred. Several temples were built to the God Aten. The Aten temples differed from the current style of temples found in Thebes and Memphis as they were open roofed to allow the temples to be flooded with the rays of the sun. The priests of Aten had a far lesser role and were expected to revere the Pharaoh and Nefertiti as gods on earth. There were limited offerings, no processions specifically for Aten and no oracles. But one of the major changes was that there were no statues to the God Aten - these were viewed as idolatry. There was even the deliberate destruction of temples and statues to gods other than Aten. The symbol of the Ancient Egyptian God Aten appeared simple. A sun disk, the ankh (a handled cross the symbol of life and vital strength and the rays of the sun. However, the additional of open hands at the end of every ray of the sun conveyed and extremely strong message. After a reign lasting 16 years from 1349BC - 1333BC the Pharaoh Akhenaten died. And the God Aten died with him. The new city was destroyed and the old Gods and Goddesses of Egypt were restored. Akhenaten was seen as the 'Heretic Pharaoh'. And his name, and that of his successors, Tutankhamun and Ay, was omitted from the official lists of Egypt's Pharaohs. Any reference to his name was avoided - he was referred to as the 'Heretic'or the 'Rebel'. Any Cartouche that was found containing his name was gouged out. The Ancient Egyptians wanted to completely eradicate his name, and the worship of the God Aten, from history.